The old standard of a showerhead with a set of dials has been a fixture in bathrooms for years, but it seems that the bathroom design industry has brought new innovations to the shower stall. According to The Republic, many homeowners are opting for showers that combine body sprays, electronic shower valves and all the bells and whistles of a modern washroom. These cutting-edge shower valves and panels are becoming increasingly popular, and as a result, their prices have dropped significantly. They hold a number of unique benefits such as being able to control multiple streams of water, temperature as well as the direction of the spray. This setup solves many of the problems of a conventional shower setup. For instance, you can shift the spray to fill up the water in your tub while shaving or you can place the controls on the outside so you will always step into a hot shower. When you're choosing the bathroom accessories to appoint your new shower, make sure to give these new panels and valves their fair shake. 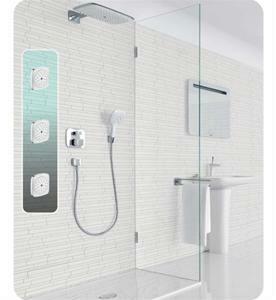 What benefits have you found from the use of a modern shower system?